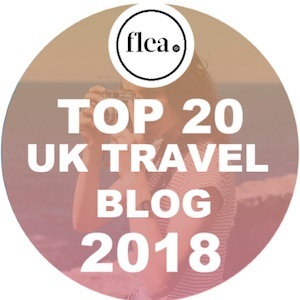 Planning a trip to the United Arab Emirates but haven’t figured out where to go yet? 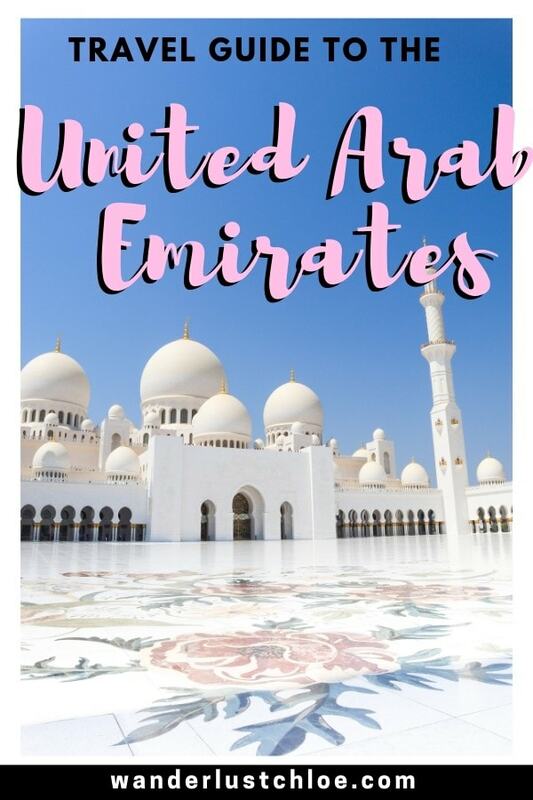 My quick UAE travel guide is the perfect place to start, with tips on what makes each emirate unique, top things to do and where to stay. 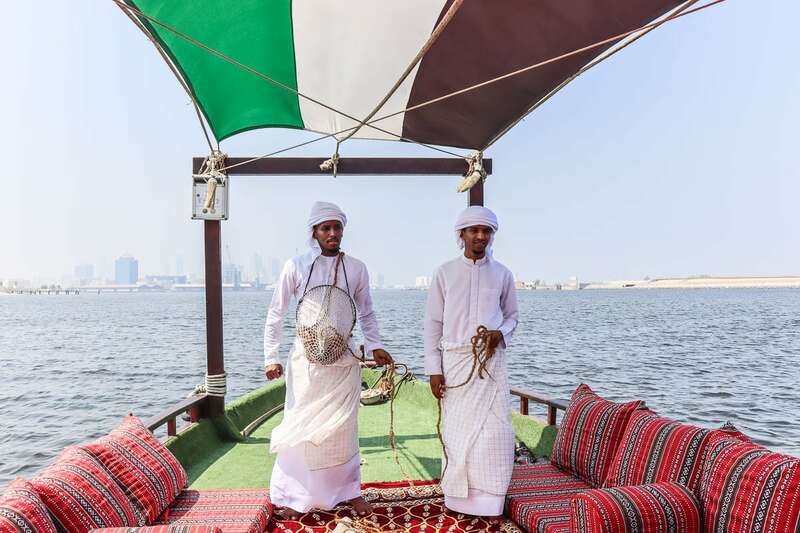 I’ve just got back from an action-packed week in the UAE with Rotana Hotels. After visiting Dubai for the first time last September, I was excited to see more of what this jewel of the Middle East had to offer. 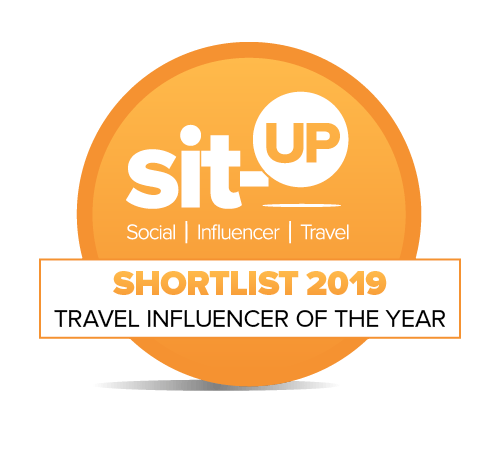 People often forget there are seven emirates in total, and while Abu Dhabi and Dubai shout the loudest, there are plenty of reasons to visit the other five. 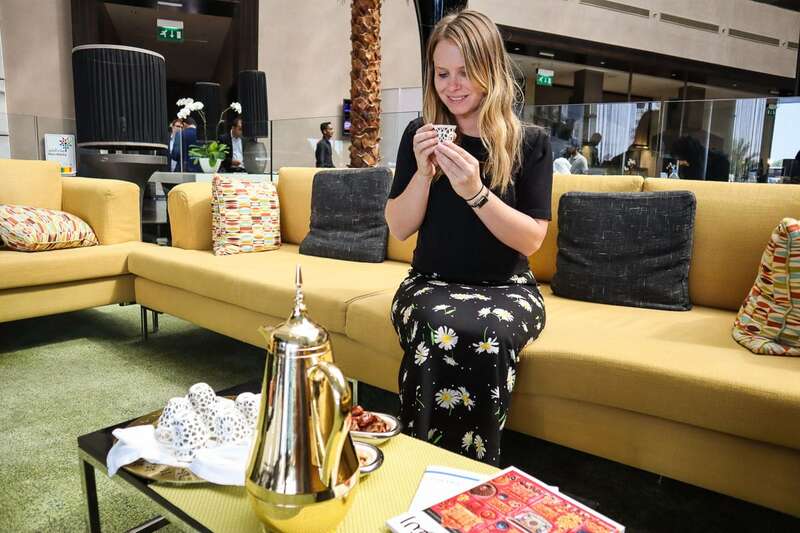 From incredible encounters with wildlife, epic cityscapes and delicious international cuisine, to art, culture and exciting activities, it’s time to share a few highlights from my time in the UAE. 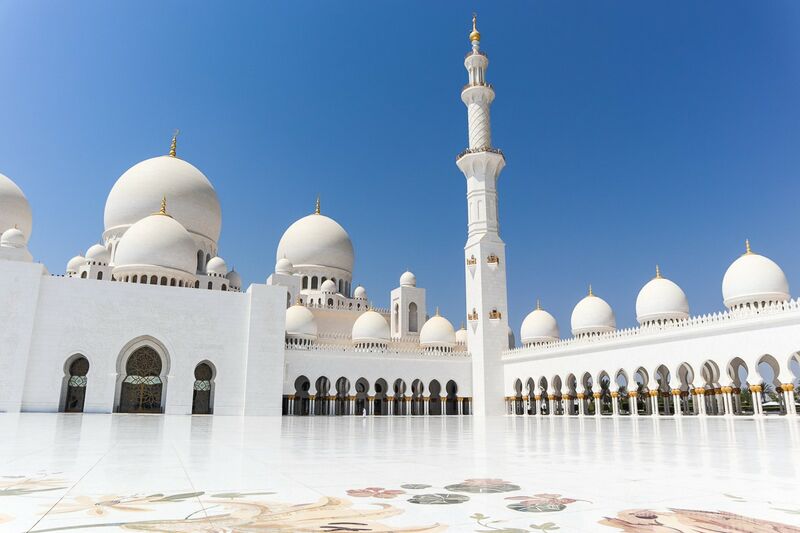 Sheikh Zayed Grand Mosque – This is one of the top places to visit in Abu Dhabi. It’s free to get in, and the architecture is simply stunning. I loved exploring the inner courtyard, with its sparkling white stone, picturesque archways and beautiful domes. It’s also worth looking around the inside too where you’ll find one of the world’s largest chandeliers, and the largest handmade carpet. As this is a place of worship, remember to cover up. Even if you dress conservatively, most women are asked to wear an abaya (available to borrow free of charge at the entrance) while men wearing shorts will be asked to borrow loose trousers. 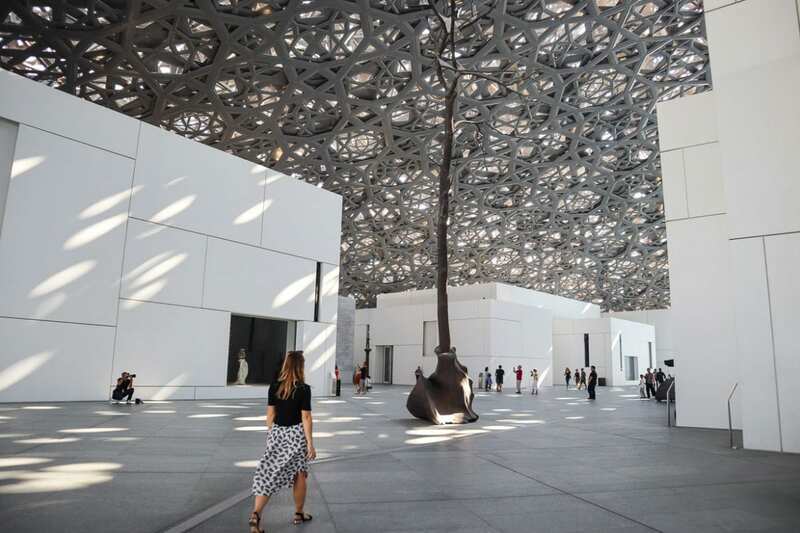 The Louvre, Abu Dhabi– Opened in 2017, The Louvre has affirmed Abu Dhabi’s status as a cultural and artistic city. The architecture of the building is mesmerising with its impressive dome. There are 55 buildings, 23 galleries, a 1,200-seater auditorium, and more to wander around at your own pace. 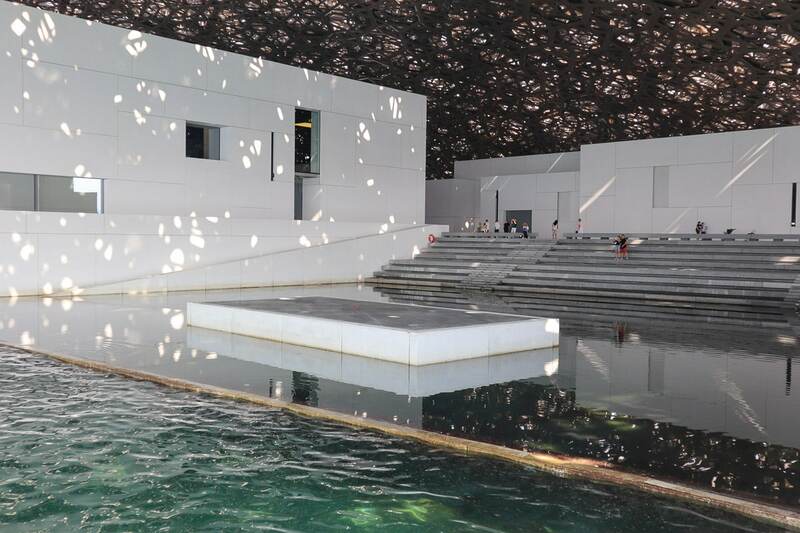 Allow some time to explore the courtyard areas, where steps lead down to the water, and mirror-like reflections will have you reaching for your camera over and over again. Buy tickets in advance and skip the line. 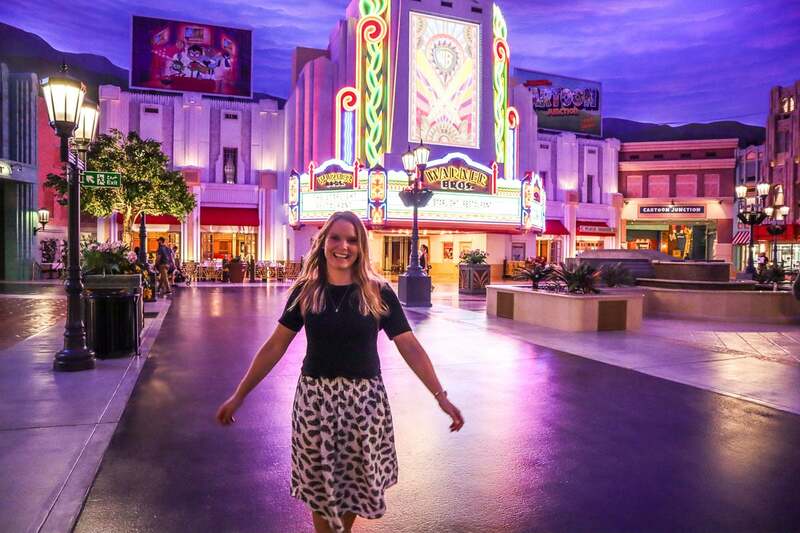 Warner Bros. World, Abu Dhabi – One of the newest Abu Dhabi attractions, this theme park only opened in June 2018. Unlike theme parks I’ve visited before, this one is completely indoors, so it’s the perfect activity for times when temperatures outside are uncomfortable. There’s a mix of high-tech 3D simulators, rollercoasters and family rides, plus a few adventure activities too. We thought it was a really fun place to spend a few hours. As it’s pretty new, it wasn’t very busy when we visited, so we didn’t have to worry about lengthy queues. For adrenaline addicts, just across the road is Ferrari World – home of Formula Rossa a.k.a. the world’s fastest rollercoaster. 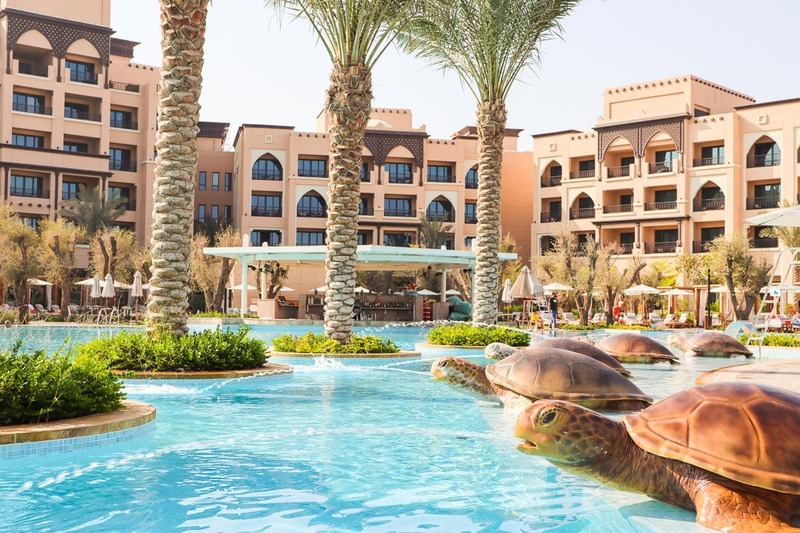 We stayed at the 5-star Saadiyat Rotana Resort & Villas, one of the best Abu Dhabi resorts, right on the beach. 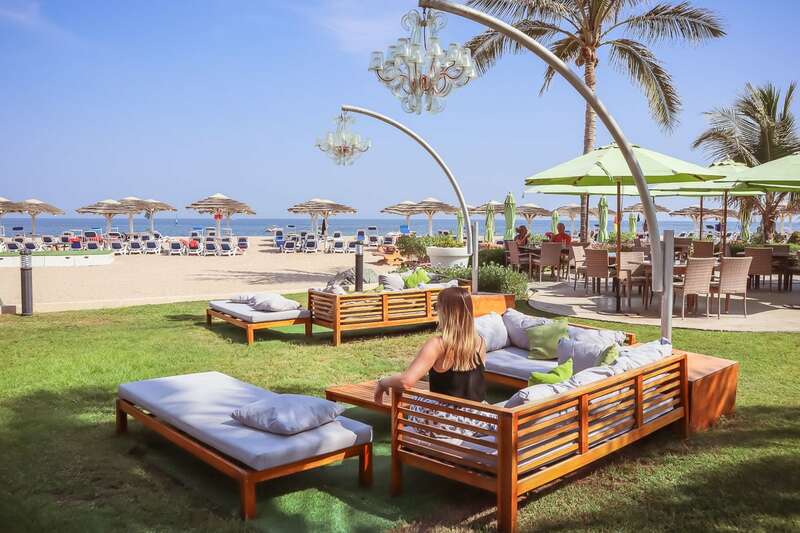 With a great spa, friendly service and several places to eat and drink, this is a great option if you want a hotel that’s still close to Abu Dhabi’s attractions. It’s around 10 minutes drive to The Louvre and 20 minutes from Abu Dhabi airport. The highlight of our time staying there? Spotting pods of dolphins backflipping and playing in the ocean, a few feet from the beach! 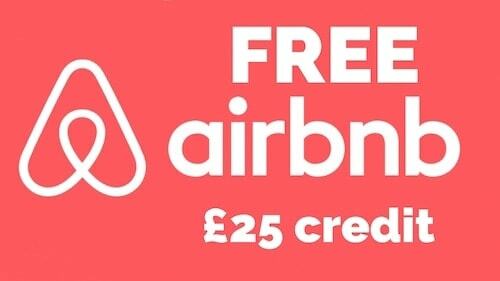 Check latest prices and availability here. Since I visited last September, Dubai’s skyline has continued to develop at a rate of knots. It’s a great city if you’re looking for a beach and city break in one. Dubai holidays are popular with Brits during winter time, when temperatures are lovely and warm in the UAE. 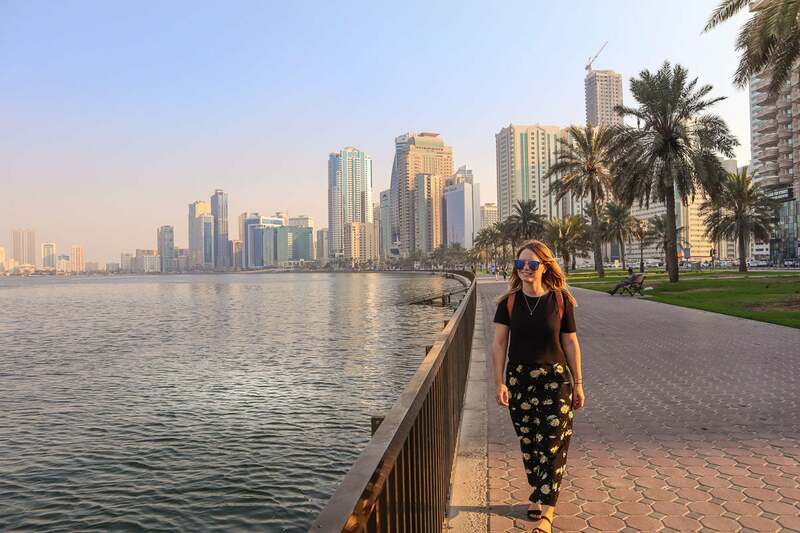 You can check out this post for my top suggestions on what to do in Dubai. Abra Trip Across Dubai Creek – One of my favourite things to do in Dubai is to hop on an abra and cross the creek. It only costs two dirhams (under 50p!) and it offers lovely views of the city. 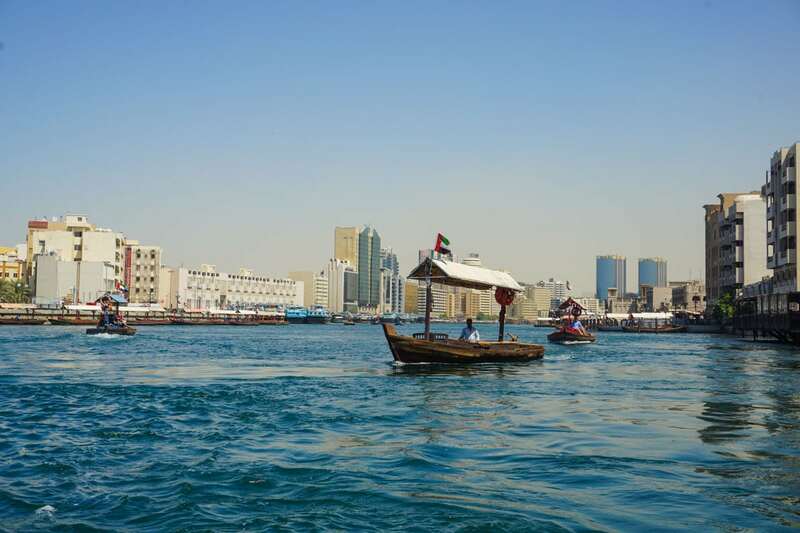 You can catch an abra to the old part of Dubai, check out the gold souk or visit some of the tourist souks for souvenirs. 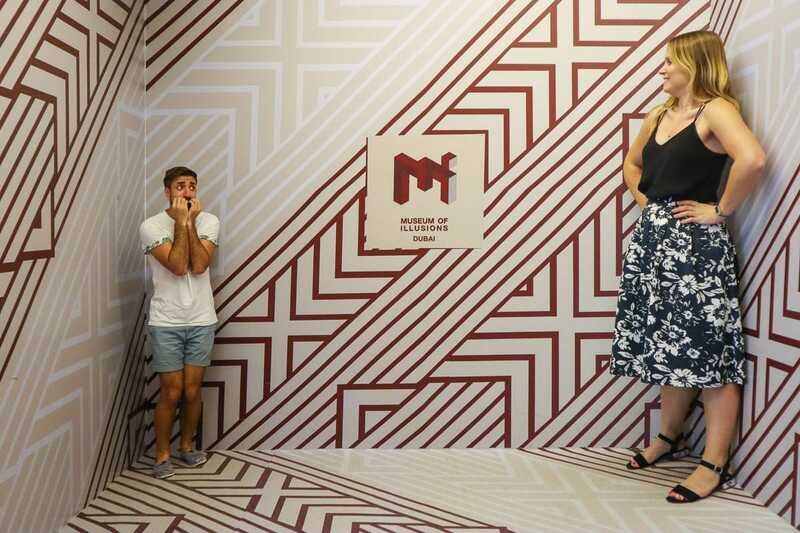 Museum of Illusions, Dubai – A fun new addition to Dubai, this museum encourages you to look at things a little differently. The interactive exhibits will have you appearing to have shrunk, be standing on the ceiling, and even have a card game with 6 versions of yourself! Burj Khalifa – If it’s your first trip to Dubai, you just have to head to the top of the world’s tallest building! It’s one of the top places to visit in Dubai, and for very good reason – the views are INCREDIBLE! Definitely check the weather forecast as you’ll want to pick a day with really good visibility. One of my favourite city hotel experiences, Al Bandar Rotana is one of Rotana’s newest properties. 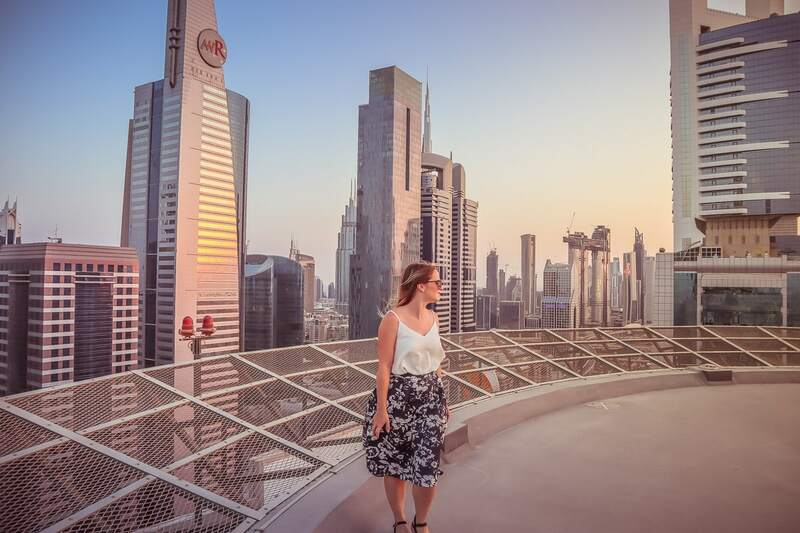 Views from the terrace of Gusto Restaurant are absolutely incredible, with the famous Dubai skyline laid out in front of you. I also adored the pool, located on the 13th floor, again with that impressive view! Check latest availability and prices here. 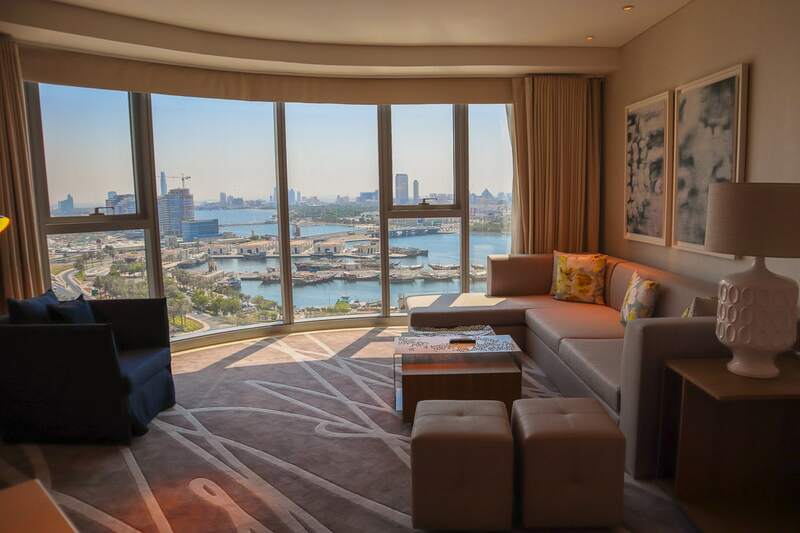 Across town, within that famous skyline is one of the city’s most-established hotels – Towers Rotana. It’s another with great views. In fact we were lucky enough to nip out on the helipad and snap these photos at sunset! 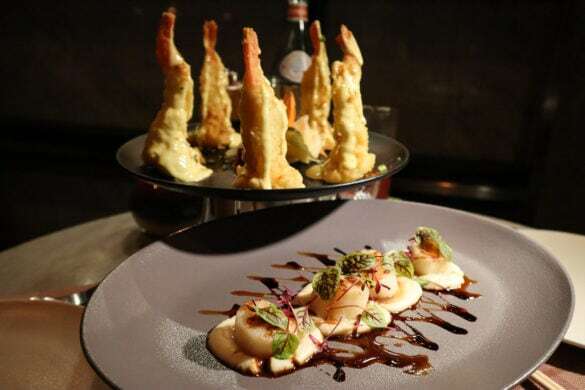 Even if you’re not staying in the hotel I’d recommend visiting Teatro, the hotel’s fine dining restaurant. 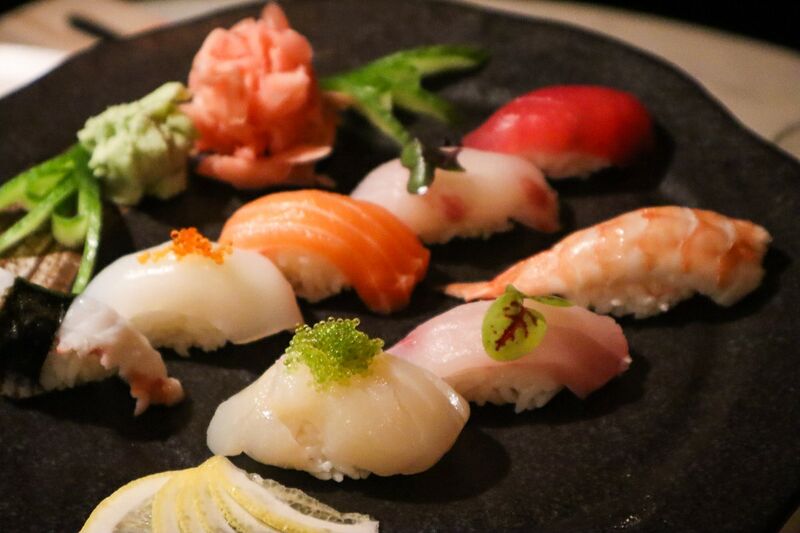 The sushi is excellent, and I’ll dream about the wasabi prawns for years to come! After dinner, carry on your evening at Longs Bar – officially the longest bar in the UAE! Check latest availability and prices here. Now we get to the emirates you may not know so much about. Before this trip, I hadn’t heard of these either, but I was pleased to find they each had their own identities and unique activities. Sharjah is renowned for being the most conservative state. Unlike the others, it’s a dry emirate (no alcohol) and you’re expected to adhere to a more conservative dress code too. 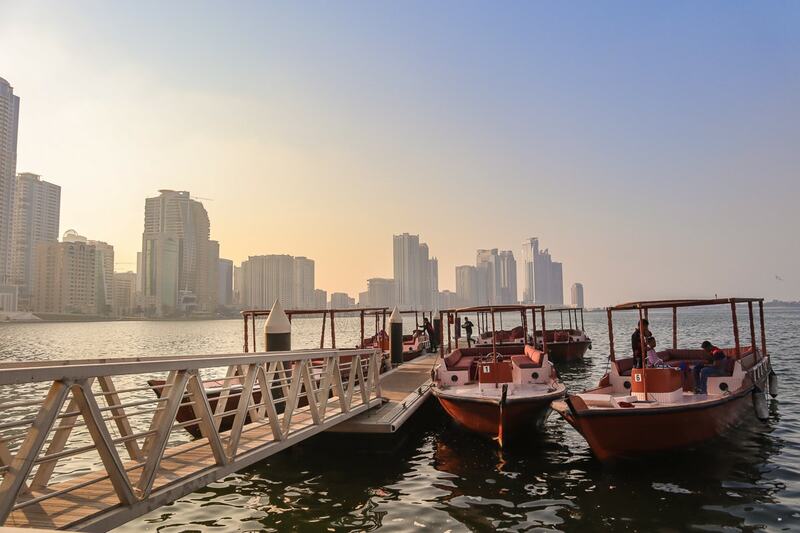 Explore Sharjah’s city centre – We spent an afternoon exploring the centre of the city and its lagoons. We took a traditional abra trip, which was a relaxing experience, and a great way to see the city’s skyscrapers. It also allowed us to take a closer look at the stunning Al Noor Mosque. As the sun started to set, it was illuminated with beautiful golden rays. Rotana’s business hotels are practical and well located. Centro Sharjah was one minute from Sharjah Airport. There was a lovely outdoor pool with plenty of spots to lounge around, plus a gym. I thought the food was excellent too, in particular the seafood evening which takes place once a week. 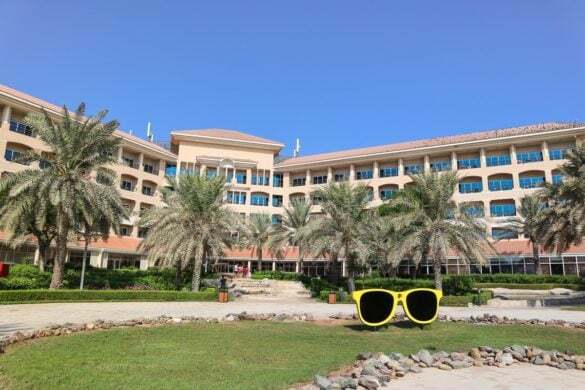 It’s worth noting that this hotel is also in a great location for reaching Ajman and Umm al Quwain. Check latest availability and prices here. Ajman is the smallest of all the emirates, and one of the least touristy. However, this is changing. There’s plenty of construction going on, and I think there will be quite a few more attractions to visit in the next few years. 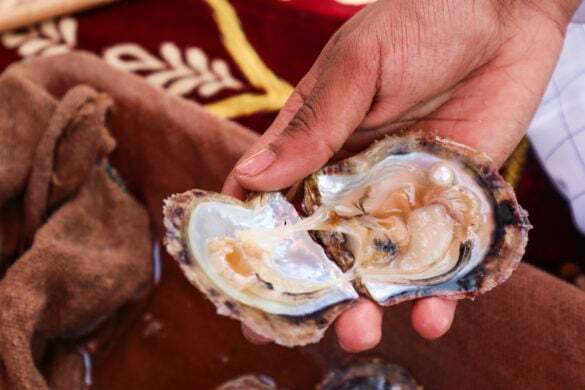 Ajman Pearl – Hop on board this tour with Ajman Pearl and learn all about diving for oysters and pearls – an important part of the UAE’s history. The tour takes you along the mangroves and waterways, while a guide explains the techniques and equipment used by brave divers who would risk their lives on a daily basis, all in the hope of finding one shiny pearl in an oyster shell. 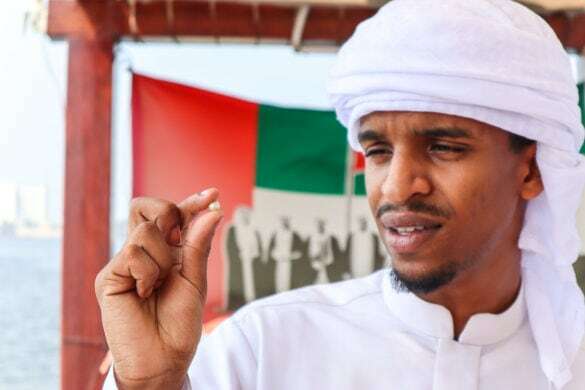 These days Ajman Pearl cultivates pearl, by placing a small grain of sand inside the oyster shells, and waiting for the pearls to develop inside (a 60% success rate no less!) As we sailed back towards the dock, we spotted some flamingos in the wild enjoying Ajman’s mangroves – what a bonus! Another of the smallest emirates, we only spent a few hours in Umm Al Quwain. Whether you fancy trying some water sports, fishing or kayaking, it’s a lovely place to explore nature. Kayaking In The Mangroves – We hired kayaks and took a trip to see the mangroves in Umm Al Quwain. The water was lovely and calm, and with no strong currents to worry about, it was an easy paddle. There were plenty of birds to see too, including herons who seemed happy in their peaceful mangrove homes. For me, this emirate was an amazing new discovery, with its epic, rugged scenery, beautiful sandy beaches and adrenaline-filled activities. As we drove the Jebel Jais mountain roads, I felt like I could be on Mars! Huge rocks, big sandy mountains and barren scenery; it felt like a big contrast to the other emirates we’d visited so far. 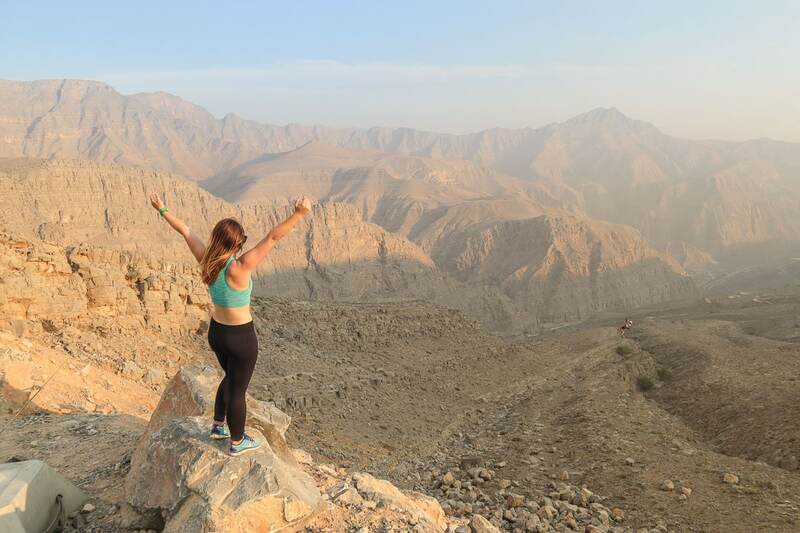 The Longest Zip Line In The World – The Jebel Jais Mountains are one of the top places to visit in Ras Al Khaimah. 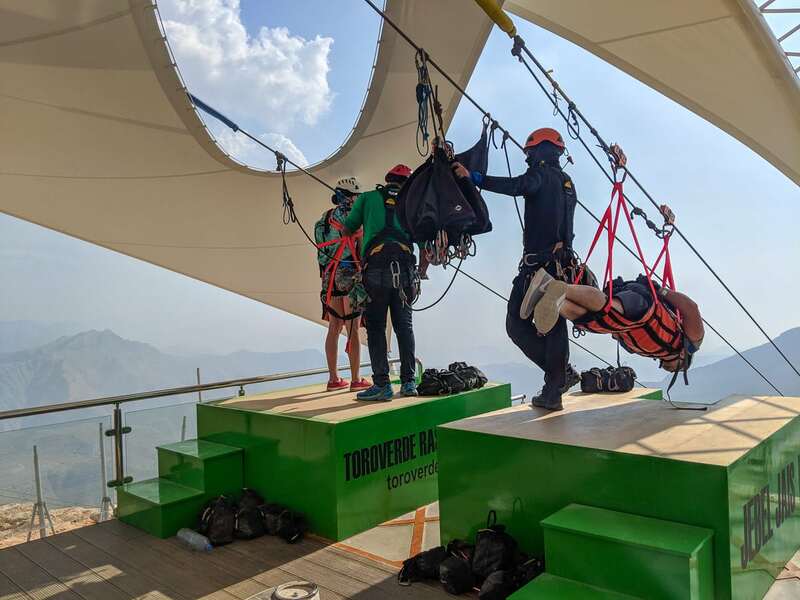 It’s also where you’ll find Toroverde, aka the world’s longest zip line. As we drove towards it, we saw the tiny dots of two bodies flying along an almost invisible wire. Wow they were going fast! I was pretty nervous, but lots of that was the anticipation and pre-flight nerves. Once we set off from the platform along the 2.8km wire, travelling at speeds of 150kph, I let out several screams and relaxed into it! I loved the sensation, and the views were as epic as I’d hoped! 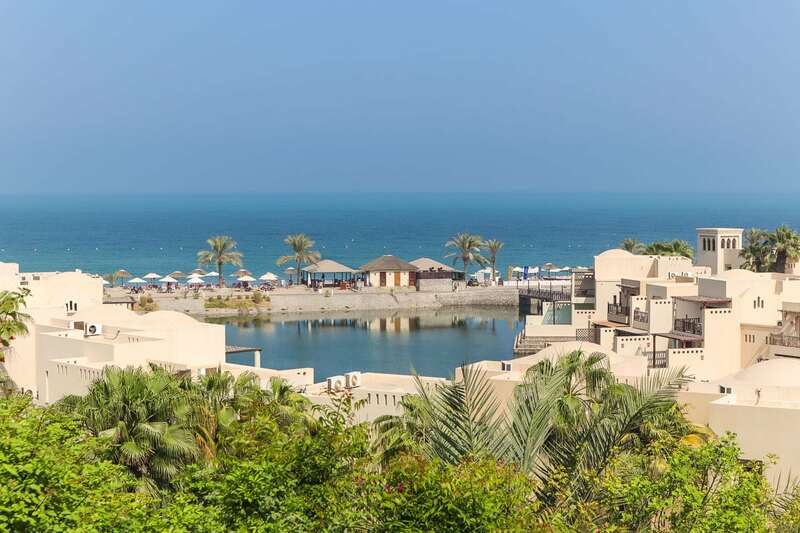 As resorts go, The Cove Rotana Resort is one of the most beautiful I’ve ever stayed in. Hotel rooms and villas are set across a slope that reaches a small lagoon, before reaching a sandy beach and the ocean. The architecture makes the views here so special. My favourite time of day was sunset, when a golden glow was cast over the resort. 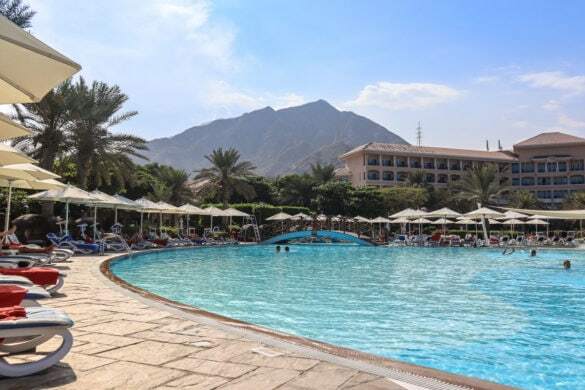 It’s no wonder it’s one of the most popular of the Ras Al Khaimah resorts! 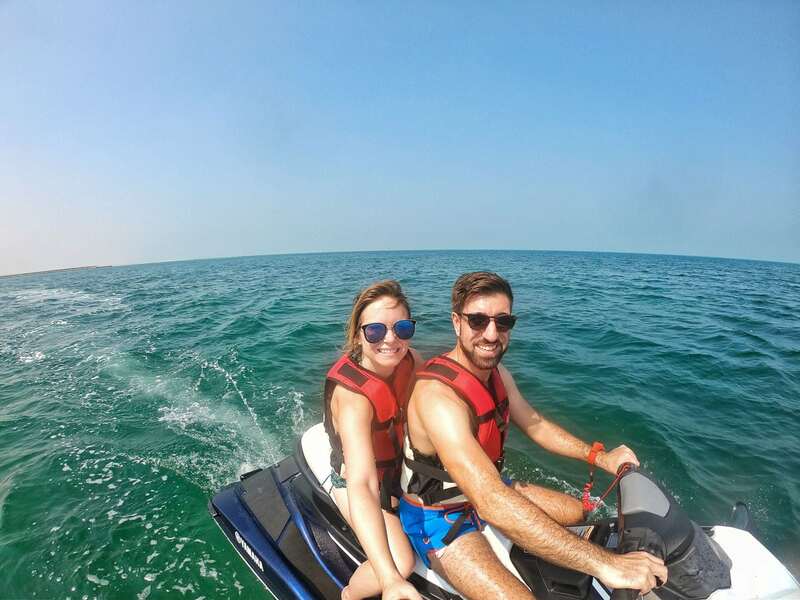 We enjoyed renting jet skis here, getting an adrenaline fix while taking in the views from the water. The food at The Cove was also excellent, with excellent curries in the main buffet, and a comprehensive and sophisticated Mediterranean menu at Basilico. Check latest availability and prices here. The drive from Ras Al Khaimah to Fujairah took us along highways flanked by sand dunes. Gradually, rugged mountains started to appear and finally the deep blues of the Indian Ocean. 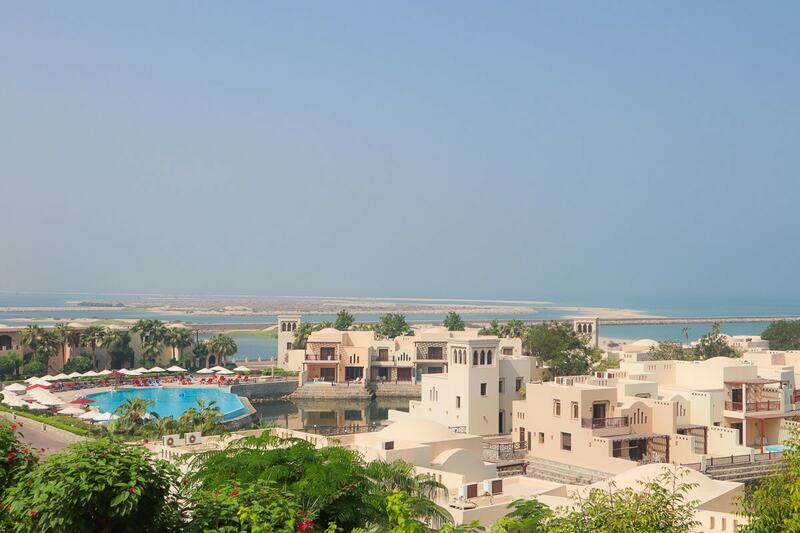 Yes, this resort is on the other side of the Arabian Gulf. 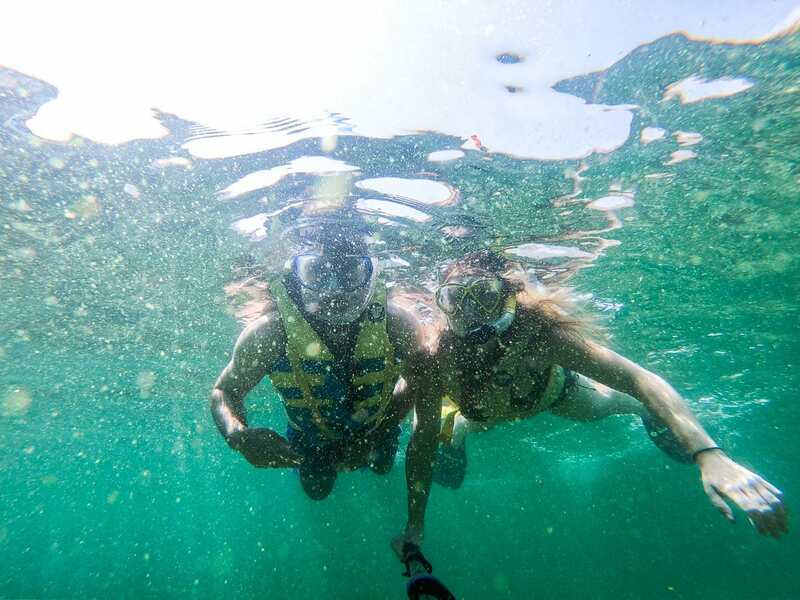 Snorkelling At Snoopy Island – This was a lovely way to take in the underwater life in Fujairah, with water sports company Adventure Sports (located on Fujairah Beach). I wasn’t expecting to see much, but once I popped my head in I was greeted by colourful angel and parrot fish. 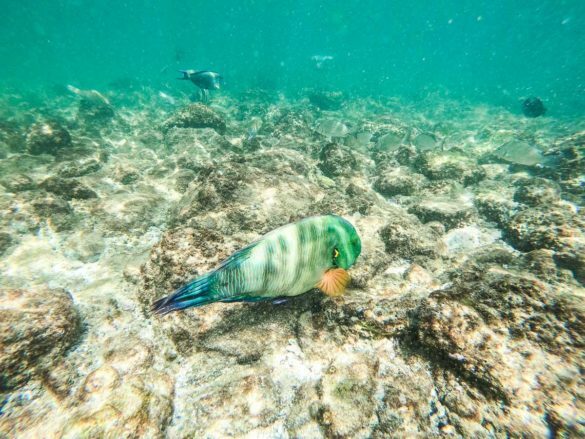 Sadly, we didn’t spot turtles this time, but they’re often spotted in the waters here. 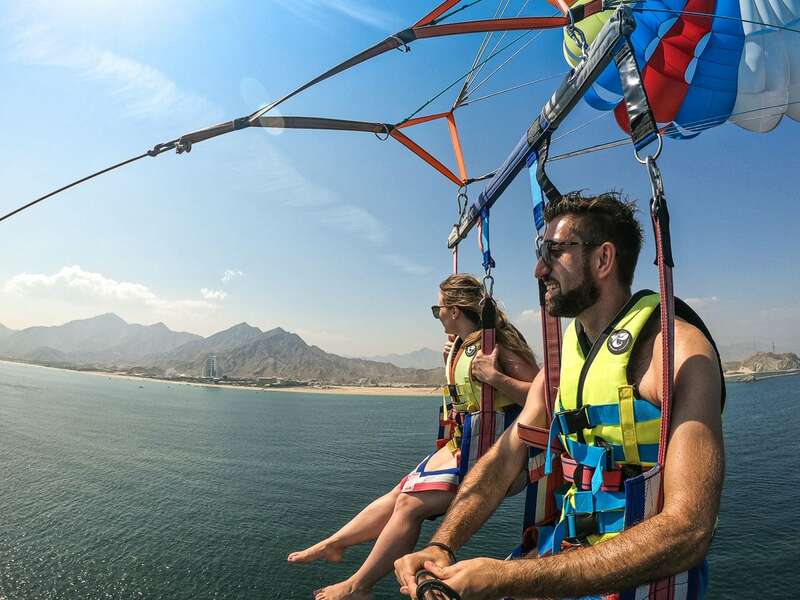 Parasailing – After taking in the views underwater, it was great to fly over Fujairah beach! The last time I tried parasailing was around eight years ago. I remembered absolutely loving it, and this experience was no different. There’s a wonderful feeling of freedom and tranquillity as you soar over the water, taking in the views from the skies. I can’t recommend it enough! We stayed at the Fujairah Rotana Resort & Spa, one of the best resorts in Fujairah. 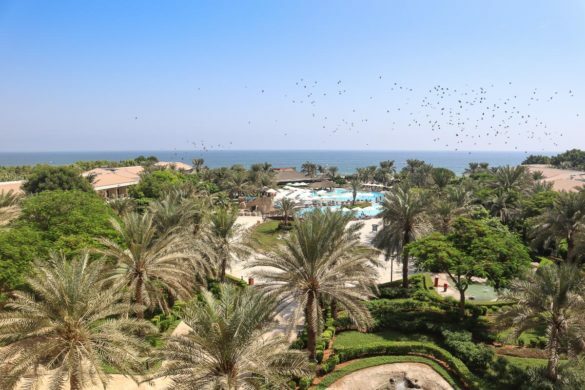 It’s right on the beach and has everything you need, including several pools, a gym, tennis courts, spa, and a handful of places to eat and drink. It would be hard to choose between beach days and pool days, as both options looked so inviting! 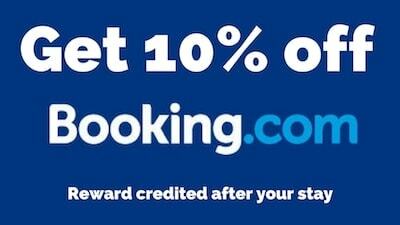 Check latest availability and prices here. 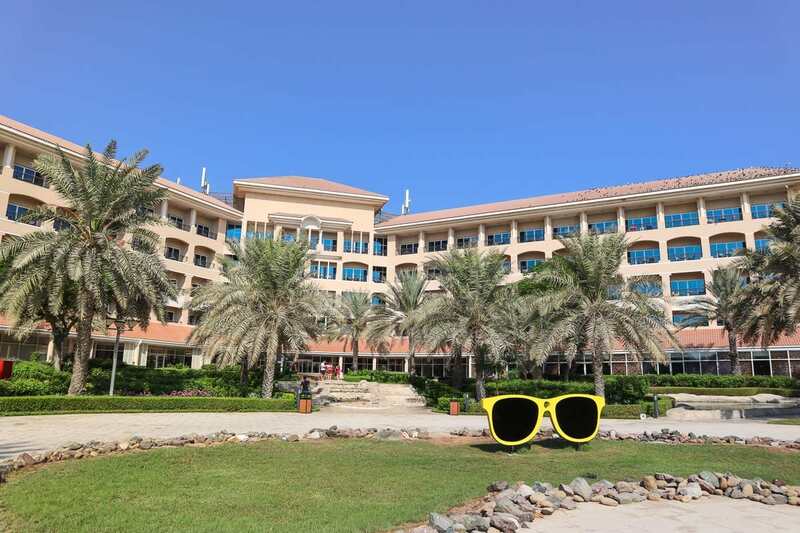 Big thanks to Rotana Hotels for inviting us to explore the UAE. As always all opinions are my own. These pictures are amazing! Thanks for sharing them. Thank you Megan! Glad you like them!